The Rev. Paul Haywood and the McGill Youth Group will be sharing from their week in Helena-West Helena, Arkansas. The Rev. Jackie Pace is the deacon of the week. She will read the Old Testament scripture and have the morning prayer. Today’s scriptures are Psalm 52 and Luke 10:38-42. The Mary’s and Martha’s Women’s Ministry will have a popcorn bar social on Friday, July 29 at 6:30 p.m. It will be a time of fellowship, conversation, connections and treats. Sign up today. The Journey Class plans to study the book “Making Sense of the Bible”. If you have a copy that can be borrowed please let Joe Anderson know. Samaritan’s Feet, a shoe distribution for children and youth, will be held on August 13, from 10 a.m. until 1 p.m. The location will be the Logan Recreation Center in Concord. Sign up to volunteer with Donna Duncan today. Christian Olympics! Mark your calendar for VBS on August 20 from 10 a.m. until 1 p.m. for ages 3 through rising 5th graders. Lunch will be served. If you have questions or are interested in volunteering for this event please see Angie Schmitt or Lauren Simpson. If you would be interested in participating in a Chrismon workshop please call the church office. Check your calendar and see what days and times are good for you around the first of October. There are patterns and supplies available to make 4 large “Glory Orbs” which would enhance our Chrismon Tree. 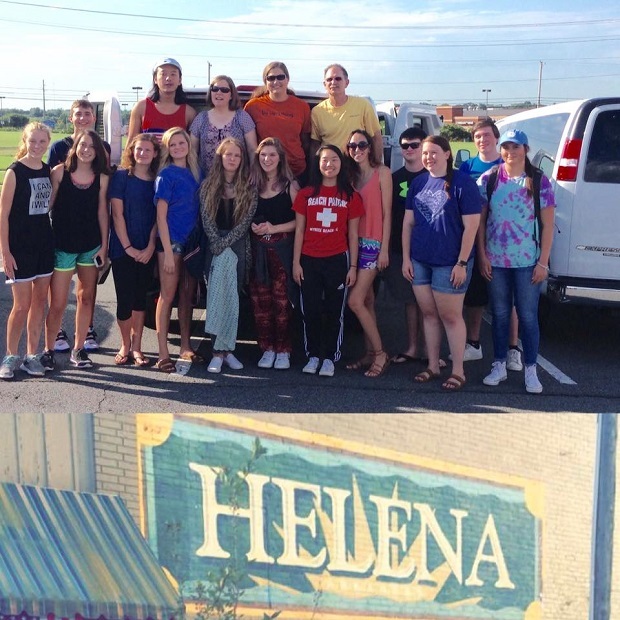 The McGill Youth Group is back from Helena-West Helena, Arkansas after a week of missions activities.